The Pioneer Square neighborhood is a premier Seattle landmark. Known for its historic buildings, unique shops, diverse community, and active public life, the neighborhood caters to residents and tourists alike. Many projects, both public and private, have been and are currently developing within the Pioneer Square Historic District. While these projects represent city- and neighborhood-wide improvements to infrastructure and transportation, without a clear vision they could potentially jeopardize the character and continuity of the neighborhoodâ&#x20AC;&#x2122;s distinct public realm. This document empowers the Pioneer Square community by providing the information necessary to influence the trajectory of public realm design and by serving as a guide for future development. The first chapter of this document, Research, provides an overview of each ongoing project and plan that will affect the neighborhood. These pages include a short description, map, and potential impacts for the neighborhood. The information lends insight to future changes and highlights opportunities that the community can leverage to its benefit. The second chapter, Inventory, is an in-depth review of the public realm. 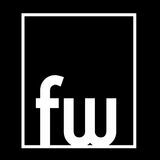 It provides insight into characteristics of walkways, streets, public and private amenities, hazards, accessibility, materiality, human activity, and buildings that help define the public experience. This information illustrates neighborhood-wide trends that can inform future public realm designs. These two chapters provide a baseline understanding of the communityâ&#x20AC;&#x2122;s public realm and existing streetscape. 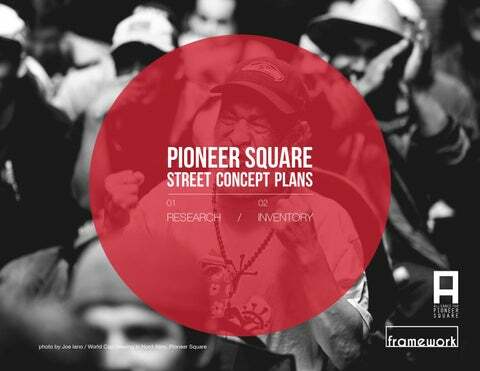 This information is critical in order to develop impactful street concept plans, to be found in the forthcoming Pioneer Square Street Concept Plans. SPECIAL THANKS We appreciate all of the people who have assisted us in this work. Their contributions are helping make Pioneer Square a great place to live, work and be. Genna Nashem, DON Sam Woods, SDOT Dawn Schellenberg, SDOT Mike Shaw, SDOT Steve Pearce, SDOT Catherine Maggio, SDOT James Corner Field Operations Lisa Quinn, Feet First Grant Wojahn, Quote Wizard Jeff Lilly, Union Gospel Mission Made possible with support from the Office of Economic Developmentâ&#x20AC;&#x2122;s Only in Seattle Initiative. RESEARCH Many projects have been and are currently developing in the Pioneer Square neighborhood of Seattle. This chapter provides an overview of each project with a short description, map, project boundary, and potential impacts to the neighborhood. The information provides insight to potential overlaps and highlights opportunities to leverage. Projects are identified in the following categories, represented by a symbol for each project spread. The central seawall runs from South Washington Street in Pioneer Square north to the northern portion of Pier 63 (roughly Virginia Street). The new seawall will support the new waterfront that connects directly with Pioneer Square. Once the construction process is complete and the seawall is in place it will support the increased activity along the waterfront, as well as activity in Pioneer Square as it is an adjacent neighborhood and directly connected to the waterfront. Policy Overview The Seattle Bicycle Master Plan (BMP) states that riding a bicycle is a comfortable and integral part of daily life in Seattle for people of all ages and abilities. The Seattle Bicycle Master Plan (BMP) aspires to encourage and accommodate more people to ride a bicycle. Policy Goals •	Increase ridership •	Improve rider safety •	Increase connectivity and bicycle network •	Increase bicycling equity •	Increase livability by creating a safe and welcoming bicycling environment Funding Funding comes from various sources including Seattle Capital Improvement Program (CIP), street improvement projects using the Complete Streets standards, and from grant funding by SDOT. By increasing the bicycling network and safety in Pioneer Square, more residents and visitors will be inclined to ride to, from, and within the neighborhood. It will be an attraction and will bring increased activity to the neighborhood. Bicycling infrastructure and the Seattle Waterfront cycle track will need to be considered with development in Pioneer Square. In 2014 a Protected Bike Lane was installed on 2nd Ave between Pike Street and Yesler Way. Also in 2014, a temporary bike lane was installed on 2nd Ave Extension to Yesler Way. Seattle’s Pronto bike share program is new and gaining popularity. As of now, there are two bike share stations in Pioneer Square. Pronto allows more residents and visitors to utilize the existing bicycle network, and associated businesses will benefit from and strengthen the areas status as a cycling destination. Bicyclists will also use Pronto as a transportation mode getting to and from the stadiums. The plan proposes general components that support walkable environments throughout the city. It does not make specific design recommendations, but the “pedestrian toolbox’ is a collection of urban design facilities, strategies, and elements2015 that can be implemented to improve the pedestrian environmentOngoing and advance the goals of the Pedestrian Master Plan. What are the impacts... A vibrant retail scene makes for a thriving economy in Pioneer Square. With careful planning, the neighborhood can continue to increase its retail vibrancy and economy. Opportunities: 2015 •	Used to launch the retail recruitment program Ongoing in Pioneer Square. STADIUM DISTRICT STUDY Phase / Policy Project Lead / DPD Timeline / 2011 Geography / Stadium District SODO Status / Policy Overview The study, created by DPD, presented eight recommendations to promote a unique stadium district with increased vibrancy, safety and programming. The plan encourages an increase of residential dwellings in the Stadium District. Better park and green street connectivity through and around Pioneer Square will increase safety and act as another attraction to the neighborhood. The existing parks that could be connected in Pioneer Square are Occidental Park and City Hall Park, which could connect to Kobe Terrace Park to the east. Looking farther afield, the parks along I-90 could create a strong connection to Lake Washington and the Mountains to Sound Greenway Trail. The Waterfront Seattle project will be a major connection along Elliott Bay and north along the waterfront. What are the impacts... The Complete Streets Ordinance supports diverse modes of transportaiton in street design, including walking, biking and public transit. This is important in Pioneer Square since it2012-2015 is a major hub that hosts a broad spectrum of Environmental transportation modes. Phase / Plan, Policy, Project Project Lead / SDOT Timeline / 2013 - Ongoing Geography / Citywide Status / Ongoing Policy Overview Parklets convert on-street parking spots into public spaces for all Seattle residents and visitors to enjoy. They increase our city’s public open space, and have added to the vitality of neighborhoods throughout 2009 the city. Parklets, which are privately-funded and maintained, activate streets, create more vibrant Complete neighborhoods, and support economic vitality. Following a successful evaluation of the pilot program in 2015, SDOT made the Parklet Program permanent and launched the Streatery Pilot Program to test new activation opportunities for parklets. The streateries will be evaluated as the Parklets were before a permanent program is considered. Policy Goals •	Provide privately-maintained public spaces for people to read, sip a cup of coffee or enjoy a bite to eat, and socialize. •	Parklets convert on-street parking spaces into community gathering places, creating more vibrant commercial districts. •	Streateries are a new way to support these goals while also responding to the demand for more outdoor café seating in Seattle, particularly in areas where sidewalks are too narrow for sidewalk cafés. What are the impacts... Parklets provide public space for all users to enjoy. They act as an extension of the sidewalk and promote social and economic activity. While Pioneer Square has existing public space, adding Parklets and Streateries would add 2009 to the type of spaces available. With so much pedestrian and street Adopted activity in Pioneer Square, the introduction of Streateries would be especially popular in the warmer months with both residents and visitors. PEDESTRIAN LIGHTING CITYWIDE PLAN Livable South Downtown Plan Phase / Policy Project Lead / SDOT Timeline / 2012 - Ongoing Geography / Citywide Status / Project by project basis Policy Overview The plan supports the Pedestrian Master Plan and most significantly looks at lighting located in the City of Seattle right of way. The lighting principles can guide lighting in privately owned spaces as well.2009 Adopted Policy Goals •	To provide a data driven plan to placing pedestrian lighting the right of way to increase safety, security, economic development and access. •	To improve how the City of Seattle plans for and designs lighting for pedestrian safety and environment. Seattle Public Utilities continues to update its infrastructure throughout the city. Any future development should be coordinated with 2012 SPU to make sure there are no proposed Substation overlapping projects. The neighborhood was coded into two segment classes of data: blockfaces (right) and intersections. With input from Alliance for Pioneer Square, a spatially-located smart-phone app survey was developed for each segment class with a series of questions that correspond to characteristics of interest. Two surveyors collected the data over three months in spring 2015 by walking every block and logging a complete survey for each segment. A separate paper survey was conducted by Alliance for Pioneer Square to capture data for alleys. A final dataset was compiled and integrated into GIS with help from students in a University of Washington geography course, who also produced social media data for the neighborhood. The public realm of Pioneer Square is highly heterogeneous. This chapter provides insight into characteristics of walkways, streets, public and private amenities, hazards, accessibility, materiality, human activity, and buildings that help define the public realm. Each data element has a corresponding map locating the occurrence by blockface, intersection, or alley. This information illustrates neighborhood-wide trends that can inform future public realm designs. This map shows the dominant surface material for all walkways including sidewalks and alleys. For walkways where two or more materials were used prominently, the surface is listed as “multiple”. This map shows the dominant surface material for all streets. Pedestrian oriented streets were included, while blockfaces that do not border streets of any kind were listed as “no street”. This map shows all elements at the edge of the sidewalk/street that buffer pedestrians from the vehicular right-of-way. With limited plantings, the predominant buffers were bike lanes and parallel parking. This map shows walkways with major surface hazards. Hazards were defined as holes or extrusions of the pavement material with a minimum depth of 2in or width of 4in. The most common hazards were pavement cracks, missing bricks, uneven surfaces from tree roots, exposed utilities and pipes, and broken glass blocks. This map shows all curb cuts within each blockface, and indicates street wheelchair-accessibility from the sidewalk. This metric includes driveways and mid-block crossing cuts, but does not include intersection curb cuts. This map shows design characteristics of streets that encourage slower vehicular speeds. This metric does not include any traffic calming at intersections. This map shows blockfaces with architectural canopies that extrude from the face of the building. Overhead canopies contribute to the public realm by creating a pedestrian scale overhead. They take on different spans (full block, sporadic, and at building entries) that offer varying degrees of enclosure and rain protection. This map shows the location of hanging flower baskets and alley flower boxes. This map shows the location of all publicly accessible trash, recycling, and ash trays. This map shows the location of any private waste containers, including trash and recycling receptacles, dumpsters, and ash trays. These receptacles were either inaccessible to the public, adjacent to businesses and hotels for patron use, or locked. This map shows the location of public seating. This metric includes all formal and informal benches located at bus shelters, in small plazas, adjacent to parks, or along the walkway. Public seating opportunities are generally absent in the commercial core of the neighborhood, and are limited to high-volume vehicular streets in the North and East of the neighborhood. This map shows the location of private seating. This metric includes all seating adjacent to businesses and intended for patron use. These seating areas were often implied as private or fenced off from public use. In contrast to public seating, private seating opportunities are dispersed throughout the neighborhood. This map shows the continuity of street trees for every blockface. Trees in medians and parks, unless directly adjacent to the walkway, were not included. A number of tree pit conditions were noted, including tree grates, tree wells, and planting beds. The images below provide a snapshot of the varied tree base conditions throughout the neighborhood. This map shows the location of all ornamental pots and raised planters for each blockface. These pots were commonly used as bollards along the street edge or as ornamental features at business entrances. This map shows historical markers. This metric includes all plaques and historical signs embedded in the sidewalk surface, mounted to the building facade adjacent to the sidewalk, or elevated on stands in the walkway. This map shows the occurrence of public art for blockfaces and alleys, including sculptures and temporary or permanent murals. This map shows the location of historic traffic lights. These traffic lights are characteristically box-shaped, range in color from black to off-yellow, and feature a wide array of pinnacles on top. m Ja ! ! ! !! While there were basic characteristics for all of the historic traffic lights, there was a general lack of continuity and style. Likely from a diversity of time periods, the variety of designs present are shown below. This map shows the location of utility boxes in sidewalks and alleys. These features are major space takers that are targets for graffiti and obstacles in the continuity of the walkway. This map shows the USPS mailboxes for each blockface. This metric includes parcel drop-offs, standard mailboxes, and green/ brown relay boxes. All of these, particularly the relay boxes, are targets for litter and graffiti. This map shows all parking meters in or directly adjacent to the public walkways. This metric includes all public parking meters as well as meters for private lots. This map shows the number of fire hydrants per blockface. This map shows the location of pay phones in the walkways. These features are targets for litter and graffiti. This map shows the location of public water fountains. These features are historic landmarks, and are consistent in style and scale while varying in color. This map shows the location of bollards in or adjacent to walkways. These features are used to block vehicular traffic, delineate pedestrian space, and to protect buildings and utilities. There is no standard bollard in the neighborhood, and they vary greatly in design (decorative, informal, utilitarian), color (green, black, yellow, gray), and material (concrete, metal, wood). This map shows the location of temporary signs in the walkways. This metric includes a-board, decorative commercial, parking, and construction signage. A-boards and decorative commercial signage help give the public realm a rich sense of place. While these elements vary greatly in design and color, they generally come in a few basic sizes and styles. This map shows the location of bus shelters. This metric does not include bus stops without overhead structures. These features are generally located on the eastern edge of the neighborhood along 3rd Ave S and 4th Ave S.
This map shows the location of bike racks using data from SDOT. Not included are Pronto bike share station locations at Occidental Park and King Street Station. Bike racks vary from SDOT “inverted U” and rail-type standards to grid-style and custom ornamental racks. This map shows where walkways were partially or completely obstructed by temporary objects, including temporary signs, orange cones, garbage bags, personal luggage, and shopping carts. This map shows where crowds of stationary people inadvertently obstructed the walkway. This metric provides an indication of areas where people gather in larger numbers than the sidewalk can properly accommodate. The images below represent a variety of the obstructions to pedestrian flow commonly found in Pioneer Square. Yelp data was collected around Pioneer Square spanning from 2005 to 2015. This data was scraped from the web using the program import.io which collects data found on a webpage an puts in an excel document. Instagram data was collected by coordinates and the keywords: “pioneersq”, “pioneersquare”, and “pioneersquareseattle”. This data was scraped using a native instagram API that enables users to search by coordinate and keyword and download the data in a JSON file. Twitter data was collected for posts using the following hashtags and keywords: #pioneersquare, #seattle, “pioneer square seattle”, “pioneersquare seattle”, “pioneer square washington”, “pioneersquare washington, and “occidental park seattle”. This data was scraped using a native twitter API that enables users to search by keyword and hashtag and download the data in a JSON file. Facebook data was collected from the “Pioneer Square Seattle” facebook page spanning from June 2014 to May 2015. The data was collected manually and input into an excel document. Students from the University of Washington Geography 469 course (Spring 2015) compiled social media activity from Pioneer Square in order to capture the “buzz” of the neighborhood. This was achieved by “scraping” data from four popular social media platforms: facebook, twitter, instagram, and yelp. The data from the four sites was merged into a combined spreadsheet and uploaded to a googlemaps webpage as a series of data points: https://www.google.com/maps/d/u/0/ viewer?mid=z-KV2X3MM18A.kA9blVCVv3vg The spreadsheet data was then converted into GIS point files, and buffered in order to create a heatmap of social media activity. The hotter (redder) areas indicate a higher concentration of both positive and negative “buzz” in the neighborhood. This chart indicates the frequency that places in Pioneer Square mentioned on Facebook, Twitter, Instagram, and Yelp. The charts below represent the 8 blockfaces with the most pedestrians (22 or more observed), broken down by activity. This map shows design characteristics of intersections and crossings that encourage slower vehicular speeds. This map shows the location of crossings with pedestrian signals. This map shows the materials of every curb cut. Curb cuts with no distinguishing characteristics from the adjacent walkway were listed as “simple curb cut”. ! ! !!! !! ! !!! ! !! ! !
! !! ! ! !! !!!! !! !! ! ! ! !!!! ! ! !! ! !!! !!!!! ! !! ! ! !!! ! ! ! !! ! ! !!! !! ! ! !! ! ! ! ! !! This map shows the number of transparent building windows (at ground floor) in alleys. This map shows the number of covered building windows (at ground floor) in alleys. This map shows the relative cleanliness of each alley. This metric observed general littler (including open garbage bags), cardboard, and prevalent negative odors. The images below represent a variety of the conditions commonly found in Pioneer Square alleys.